Cold meat is called to the meat products made from a mix of minced meat, grease, salt, spices and additives and stuffed in natural or artificial guts. 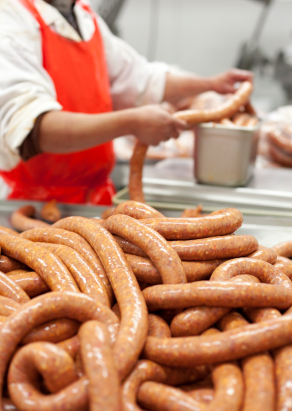 Cold meat variety depends on the elaboration process as fresh cold meat, boiled, dried, smoked, etc. Main cold meat ingredient is pork or beef meat, but it can be also wild pork, deer, etc. Grease is another essential material for cold meat, and it can be added as fat piece or infiltrated in lean. Cold meat contains salt for tasting, preserving and microbial growth delaying. Sugars as starch, glucose, lactose, etc. are mainly used as energy source for lactic-acid bacteria, essential for cold meat elaboration. Nitrates cause the characteristic rose color of cold meat. Spicy and condiment give the characteristic taste to distinguish every cold meat variety. Finally, natural or artificial guts are essential to keep and stuff the product. Cold meat made in a natural way is well recognized by its high quality, but it depends on weather changes, what makes difficult to obtain a homogeneous final product along the year, for this reason, technologies (industrial dryers) are developed to control and adjust the parameters for cold meat elaboration. Bernad design, install and start up plants for cold meat elaboration and meat salting, adding technology value to all our projects. Here you can see a wide range of machinery and parts for a good quality process of cold meat elaboration, as mincers, mixers, lain stuffers, binders, staplers, etc. orientated to cover all the necessities for small butchery and big automatized installation.